This Fire Extinguisher course has been structured to give all staff the confidence and competence to tackle an early stage fire in their workplace. Your staff will gain practical experience of using fire extinguishers and all courses can be bespoke to your actual requirements at your premises at a time that is convenient to you. All workplaces are provided with fire extinguishers to a greater or lesser degree. The purpose of fire extinguishers or first aid firefighting equipment as I like to call it is to enable trained staff to tackle an early stage (small) fire to prevent it from growing and either putting persons at risk or from causing more damage to your premises. Your fire risk assessor should give you advice as to the number, location and type of fire extinguishers that you should have in your workplace. Normally extinguishers are located on the exits from floors or near to high risk areas such as large electrical installations. There is a method for calculating the number of extinguishers that should be provided and from my experience many workplaces have more than they actually require and sometimes the wrong or not most suitable type for the hazard. If you provide firefighting equipment then you should by default train staff to use it safely and effectively, on our courses we more importantly also train your staff to understand when it is not safe to use first aid fire fighting equipment. An understanding of the importance of fire safety in the workplace. An awareness of the principles of combustion and fire spread in a building. An understanding of the actions to take on discovering a fire. An understanding of the use and limitations of workplace firefighting equipment. Perception of the risk that fire presents. Fire spread within a building and the inherent hazards created. Our courses will provide your staff with the information and training that they need to enable them to help protect your business in the event of a small fire occurring. 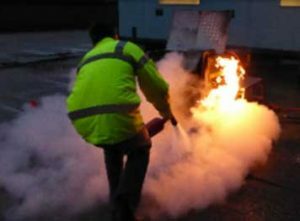 Many staff have never handled a fire extinguisher in an emergency situation so our eco-friendly gas fired simulators will allow them to go through the procedures in a safe and structured manner. We emphasise that we do use simulators and cannot simulate the conditions that may be faced with in a real fire situation, we do show your staff how fires start and given the right conditions how rapidly they will envelope a room. Many years fire and rescue service experience allows us to add a little flavour with the use of anecdotes that help put over our fire safety message. Fire prevention is the best form of firefighting; first aid fire equipment is the immediate way of trying to stop a small fire from putting you out of business! Statistics indicate that over 80% of fires in the workplace are dealt with before the fire service arrives if they are tackled by trained staff using the correct equipment. 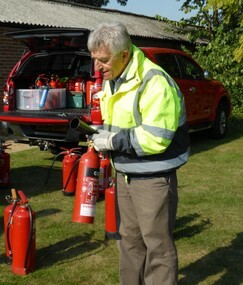 “BE FIRE SAFE” call Anglia Fire Assessments on 01603 872984 to arrange fire extinguisher training. The course structure is aimed at improving the understanding of all staff of the very real risk that a fire in your workplace can present to their safety, the safety of other occupiers of the building and the business continuity of the premises. A Fire Extinguisher Training Certificate will be awarded on completion of the course. 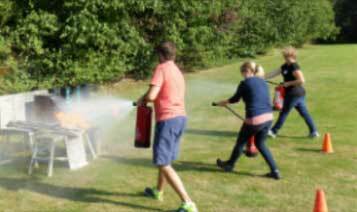 Practical fire extinguisher training using eco-friendly gas fire simulators. Course including live fire practical extinguisher session from £350+VAT for up to 10 delegates.